After some initial problems and a busy weekend I finally got around finishing the review of this new radio. If you hate lengthy reviews: this is mainly a Baofeng UV-5R in disguise. If this is all you wanted to know you can leave now. Still here? Some things changed for the better, some for the worse, but most things (including notorious UV-5R flaws) didn’t change at all. Below are my findings in a nutshell. I didn’t make many pictures yet, but will add a few later. One thing you can’t miss is the size of the radio. In my experience this is one of the strong points of the radio. The UV-82 feels much more comfortable in your hands, the keys are larger and RX audio sounds slightly better, probably as a result of better acoustics. Instead of one dual-color LED at the front of the radio the UV-82 has two separate LEDs located on top. The flashlight now includes a strobe function. The Band key disappeared. Band can be selected in the menu. The battery is bigger and shaped differently. Longer antenna, supposedly suitable for use up to 520 MHz. Dual PTT keys. Press the upper one to transmit on VFO A, press the lower one to transmit on VFO B. Improved manual, but content can still be confusing at times. Regardless of what’s printed on the label, the battery capacity is still 1800mAH. Both radios use the same .dat format for programming. On average there’s a gain of 1 Watt when compared to the UV-5R. Contrary to popular belief this won’t translate into a better range. Only antenna quality and antenna height can make a difference, and so does the lack of obstacles (buildings, trees, hills). All UV-5R models I own perform quite good. This radio behaves a bit differently, possibly due to the higher power output. There are more visible peaks in the spectrum and overall suppression suffered a bit. I had to make an extra screenshot to show a 4th harmonics on VHF. Interestingly, it’s stronger than the second. VHF second harmonics: -55dBm. Acceptable. VHF third harmonics: -48dBm. Room for improvement..
VHF fourth harmonics: -55dBm. I don’t want to see this one at all. UHF second harmonics: -50dBm. Acceptable (but only just). UHF third harmonics: -57dBm. Acceptable. If you’re looking for a Baofeng UV-5R in a bigger package delivering more RF power, this radio might be just for you. There are some changes I don’t like, such as the disappearance of the VFO/MR button. Switching the radio off and on to switch back and forth? Come on, give me a break! The dual PTT system as a replacement for the ‘preferred TX VFO’ option looks nice, but proved to be confusing at times. If you don’t pay attention you’ll press the wrong button more often than not. It’s probably just a matter of getting used to. Improvements I really hoped to see (better front end like the UV-B5, no rounding down bug, user-friendly programming, alpha tagging from the keyboard) didn’t materialize. Improvements blind ham radio operators would love to see (hear!) aren’t there either. Menus still are announced in such a way that it is of no use to them. Go to the parameter menus for example and you won’t hear anything at all. How can they find out which CTCSS tone is displayed in the screeen? As far as they’re concerned, the voice prompt is pretty much useless. The S-meter still isn’t one, and squelch levels still don’t mean much. The RX roger beep is silly, and so is the strobe function on the flashlight. Then there is the drop-in charger, which is constructed in such a way that it will be the first thing to fail prematurely. Dear Baofeng, we know you can do better. We will gladly pay you a few bucks more. 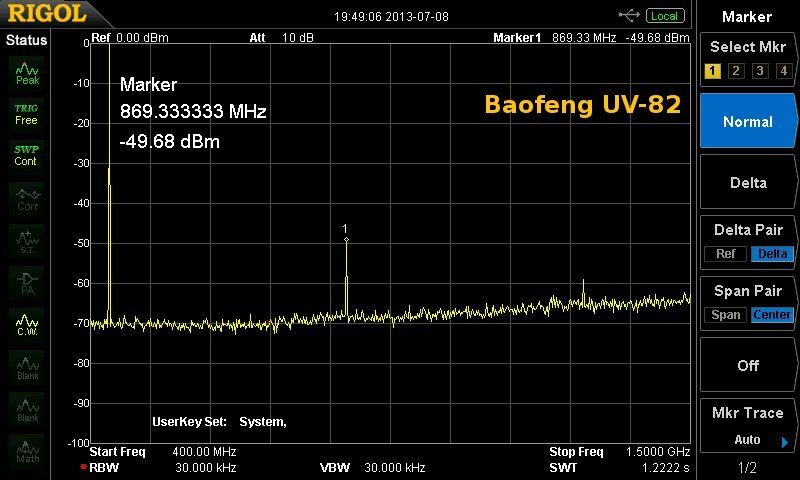 So, is the Baofeng UV-82 a bad radio? No, not at only $50. There’s just not enough progression to warrant dumping your UV-5Rs and replace them by this one. So what is your current favorite Baofeng if you were buying new without owning anything? What is your current favorite Chinese HT overall? For ham radio use the UV-B5 / UV-B6. While boring in appearance and lacking fancy options, these radios deliver. When price is less important, Wouxun is still the way to go (or maybe the Quansheng TG-UV2 if you don’t need DTMF). From all cheap radios you like the UV-B5 / UV-B6 best, or is the UV-82 the better radio. I have to decide i thake the UV-B6 or UV-82, i like the more power, but the UV-B6 is easier to get here, i am from the Netherlands. What would you take the UV-B6 or UV-82. the UV-B5 is the better radio in terms of receiver quality and modulation. The receiver of UV-B5 will stand its ground in difficult circumstances, the UV-82 might fail (overload). The amount of overload depends on where you live. You won’t notice it in the middle of nowhere. My location is notorious for receiver overload problems. The one Watt extra makes no difference in real life. To gain just one S-point, the output would have to be 16 Watts… in reality all it does is drain you battery faster. Thx Hans for your fast answer, now I now what to do, i will get a UV-B5 or UV-B6, the UV-B5 its not easy to get here, maybe ebay. Just an FYI… CHIRP compatibility is in the works. Chirp support is probably not much of an issue (same format). I mod the Yahoo uv b5 group and approving new members at a pretty fast pace now, I think the word is getting out. Anyway… 50 greenbacks… Of course I’ll get one. Good detailed review however I took a few mins out and I believe no two radios are the same,, all very similar, re the harmonics did you try more than one rig? I can’t afford buying a whole bunch of them, of course, but I often can borrow one later in time. Sensitivity of both the UV-5R and the UV-82 is -129 dBm on VHF, it’s technically almost impossible to improve on that. No problem, I didn’ t mention availability. To the best of my knowledge you’re the cheapest source so far. For Europeans eBay or Aliexpress might be a better choice (shipping costs). Actually my UV-5R does have a strobe function, the firmware on yours must be older. The latest software version in my UV-5Rs is BFB251, that explains things. Thanks for mentioning. Great review Hans. I had hopes it might be a UV-5R “killer” but I´m just glad you saved me 55 bucks. Thanks to Jim and Dan, the UV82 is now compatible with CHIRP. Temptation got the better of me, just ordered one off ebay at £32 ($48). I guess they hid the VFO/MR switching, which could be a good idea once they are programmed up on Memory, they can be locked and left there without little fingers messing and causing unknown interferance to other services on other freqs out of the users band. Switching modes involves powering on while pressing and holding the menu key. That is something you don’t do accidentally. So which one you choose between UV-B5/6 and UV-82? I have UV-B6 but going to buy UV-B5 because I don’t need flash light so UV-B5 is better for me. But I’m curious about this UV-82. No contest, the UV-B5. Review UV-82 here. How does the UV-82 compare with the UV-82L? 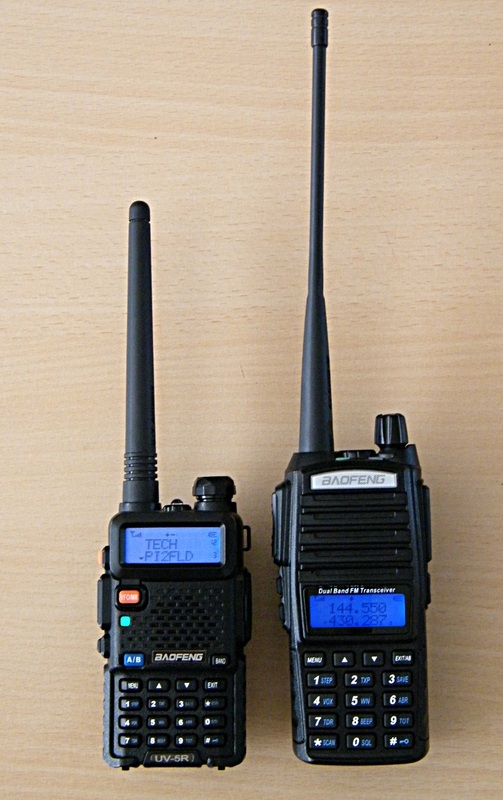 Two specs I can see for the UV-82L (http://www.radioddity.com/us/baofeng-uv-82l-two-way-radio-dual-band-uhf-vhf-136-174-400-520mhz.html) and (http://www.ebay.com/itm/2014-Baofeng-UV-82L-VHF-UHF-136-174-4-00-520MHz-Ham-Two-way-Radio-Walkie-Talkie-/190900120922?hash=item2c7288ad5a) show that the TX power max for the UV-82L is 8W. But they’re the same price (ebay, Amazon, Radioddity, etc. ), so maybe a little better “progression to warrant dumping your UV-5Rs” ? I have seen lots of supposedly 7-8 Watt hand helds, but none of them delivered. What I also see in the specs is that spurious radiation (harmonics) is 7 Watts! Now that would really ruin your day, and would draw (unwanted) attention of authorities from day 1. Basically you can’t trust these specs. They’re clearly written by someone who doesn’t know sh*t, can’t translate, or tries to make things look nicer than they really are. When looking at the history of the UV-5R, which now has countless varieties which are technically 100% identical, it looks more like another Baofeng variety soap in the making. Apparently you were right! I took both Radioddity and ebay to task on these two ‘specs’ based on your reply, and they have both since corrected their specs to read 5W instead of 8W. Radioddity actually issued a written apology to me for the misleading spec. I’d be happy if mine managed half that, on my meter ( yes IT IS calibrated and accurate to within 0.15W ) i get 0.75W on low power and 1.1W on high power….which is rubbish…but having 3 other chinese made HT’s that all claim 4-5W output, and none peak over 2.1W i’m not surprise this UV-82L is any different. I also have to mobile “Professional” radios, both chinese made, one claiming 45W out on HIGH power, the other 65W on HIGH, and neither of them can hit 23W flat out….. These chinese radio’s are a con, and are buyer beware items, one in ten MIGHT work as claimed, the rest in my experience are well below claimed figures. I have seen more than 15 UV82 radio’s in the last 4 months, and the HIGHEST output any obtained on my meter was 2.85W on high power. I agree… It seems there’s a math error. 8 watts from a 7.4 volt battery is nonsense! For this you need other hardware (amplifiers) and higher voltage (11.8 volts). But that is about 100% of possible performance. Longer passages and improper antenna and it smokes. The Chinese are funny to see the details!! Device receives a different name and there are 2 watts it popped. I am curious as to who on earth said it would do 6 to 8 watts? that preson/company needs educating. When it comes to advertising, you’ve seen nothing yet… Most buyers aren’t even hams, and probably have no clue how to measure output power. No knowledge, no complaints, seller gets away with it! I am Curious what you would rate the UV-82 out of 10? “1:The 2014 Baofeng * UV-82L * transmit and receive signals more sensitive than other walkie-talkies, with the new circuit design, stronger stability and anti-interference ability. PS I love your blog, it’s fantastic! the UV-82(L) is not more sensitive than the UV-5R. Actually, most (if not all) Chinese radios show identical sensitivity. The reason for being better than the UV-5R is the better stock antenna, which is identical to the one delivered with the UV-B5. Unfortunately the front end hasn’t improved, which causes the UV-82 to overload just as quickly as the UV-5R. Notorious UV-5R flaws/bugs are still there also. 3. Higher output power (5/4 Watts instead of 4/3 Watts). All in all I see no reason to give the UV-82 more points than the UV-5R. The UV-B5 still wins by a generous margin, thanks to the excellent receiver. There’s no point pumping out more Watts if you can’t hear the other station due to overload. Uh…for me, the UV-82L performs hands-down better than either my UV-B6 or UV-B5 or UV-5RA. Bottom line: I’ll never buy another Baofeng besides the 82, unless I can get it for near-free. And no, I have no idea why the 82 seems to perform better for me than it did for you. These tests were all done on different days, but within a week of each other. In the end it doesn’t matter at all what my findings are. All that counts is whatever works for you. If that’s a UV-82: great! Here the UV-82 is unusable due to high levels of RF pollution, combined with the UV-82’s poor front-end. Thanks for replying to my comment you cleared up what I was curious about. I have another generic question but wasn’t sure where to put it. I saw in the pictures of your shack you have a couple ICOM units. I’m looking for a two way radio/walkie talkie to be used in a rural area ( in Canada on a lake with line of sight) and hoping to communicate upwards of 8-10km distance from some hand held units. I know typically VHF will do better in open areas, but is there something I should be cautious about when some manufacturers claim 5w vs 7w? Will the extra 2 watts help improve distance or will it just add noise? I came across some of the marine ICOM IC-V85 units that are 7w with a nice length antenna. Would a unit like this possibly be able to get that range? Or is there another unit you might recommend for this type of application? It is very unlikely that you will notice better range with only 2 Watts extra. You need to multiply the power by 4 to achieve just one s-point (6dB) of gain. Getting out 20 Watts of power out of an HT is not possible, for many technical reasons. So, basically, buying 2 Baofeng UV-B5 radios (my favorite at the time of writing) would achieve the same goal as 2 expensive Icom radios. Range varies depending on terrain, but when there aren’t any obstructions 10 Km doesn’t sound impossible. The best way to improve range is experimenting with antennas. If you might be interested in a good quality, robust HT I have a commercial Icom IC-F30-GT with 250 channels VHF (130-174MHz). I have a commercial speaker mike, programming & service software with manuals, instructions for “dealer mode” (i.e., from the keyboard), etc. etc. I’m will to part with. Radio can be programmed for all 250 channels contiguously or programmed into 16 banks. Capable of bank scan according to bank scan lists. I’ve just got too many radio sna dwant to trim back a bit. Let me know whether or not you have any interest. 73! I want to select what channels I want the UV-82 to scan. I don’t want to scan 40 channels, how can I select what channels I want to scan? You can skip channels, but only in the software. The option is called ‘Scan Add’ and can be set to On or Off for every individual channel. I have the chirp program and see the skip option, but it appears that it is not activated. Ralph, I’m using CHIRP on my UV-82. The Skip column appears blank, but if you click on the field at the far right, the dropdown menu with the S option will appear. Hi, the UV-82 as Scrambler function ? Thanks for your review. Just received a UV-82L and couldn’t figure out how to switch to VFO mode. A google search brought me here, thanks for that. I agree it’s not the best way to switch back and forth but for some users there may be a benefit to have a radio ‘locked’ into MR mode. A stretch. You have to wonder what goes on in the meetings where they decide to build a ‘better’ radio but then leave useful buttons out while in general making a better keyboard. Cultural differences perhaps. Still I am amazed at the apparent build quality of these $50 radios. The UV-5RA I got at the same time is also a very nice value. Perhaps there are benefits to the 82 I don’t see yet but right now it appears you might as well keep that $20 in your pocket and get the UV-5. It’s only my first experiment with these cheap HTs though, I’ll have to compare them with my TH-F6A and TH-D72A’s. Just for reference, here’s a link to a UV5R vs UV82 comparison. It’s part of the Miklor site dedicated to that radio. Hope this helps make the voyage a bit smoother. No, it is fine, and you can set squelch tail elimination in one of the menus. Thanks for the info. I just picked up one of these and plan to do a writeup and review of it at my blog also. But you have some really good info here. I understand you can Press the “EXIT/AB” switch in the upper right-hand corner to switch from VFO to memory without turning the unit off & on. I just tested – doesn’t work on mine either. I held the button down for several seconds also, no effect. Does anyone know what the difference between the Baofeng UV82 and UV82L. I ordered a 82L and received an 82, I don’t know if it’s worth returning it for the 82L. No difference between the two models at all. Only the ‘X’ version is different (220MHz). I suspect we’ll see a lot more model numbers in the future, just like what happened with the UV-5R. Dozens of model numbers, all the same radio. We started the X model so it could be distinguished between other name plates, its annoying that Baofeng continue to allow for other companies to put a different set of letters on the radio, all it does is confuse consumers and the one company who still demand they put 2800ma on the batteries and call the radio a UV-82L (L standing for large capacity battery) needs to be slapped on the wrist for this deceptive listing. Speaking of which: some listings on your website still show a picture of the non-existing 2800mAH battery. They do Hans and the text mention that they are 1800ma and not 2800 as shown, I don’t think I can be any clearer than that? A new picture would eliminate all doubts, don’t you think? Martyn – I’m with Hans on this. If you want to be the good guy in the UV-82 business, then find the time to replace the picture – or just remove it. Interesting.. Thanks for the info, guess I’ll save my money and keep what I have. If what you say is true….then WHY does the sticker under my battery say UV-82L ???? It’s a little thing called badge engineering, here in Australia we suffered it all the time in the 1990’s…..mostly with cars, and VCR’s….but it was the same….your comment that the type 82L does not exist is not correct…the label on my radio says clearly UV-82L…therefore it IS a UV-82L. I’m new to this and only recently came across UV-5R, which is “cheap-as-chips”, compared to what Radio’s were a few years ago. I am just wondering if the Power Output (5W) is the same for VHF and UHF Band on UV-5R? I have seen the “Power Out” specs above, but I’m assuming they refer to the UV-82 and not UV-5R. I love having a manual SQL for adjusting (without going into the Menu), but think that’s just me being old fashioned. P. S. Great thread. Very informative. Keep it up. Power on the UV-82 is said to be slightly higher, but not enough that you will notice any difference on the air. The biggest difference is in the antenna. Is it true those radios can operate temperature – 20 celcius as is advertise on the box label ? The radio will probably do fine. I’d worry more about the battery. Thats what I meant – battery.the best for winter and montains are Ni-Cd. Refering to Baofeng, under havy conditions as – 20 or -25 display may get creazy. Digits acting as slow ontion or….vanish at all, especialy in china radios. Try make some test by the way in minus degres condition. 1. I noticed a note on this site: http://baofengtech.com/?gclid=CM6hpuGB_bsCFQWTfgod3BwARA regarding updated firmware “including the squelch” issue, and was curious if anyone noticed a difference before and after the S21 update. 2. I read that the UV-82 has an improved antenna and was curious if there’s any reason to pickup the “$3.97” (or was it $3.79) antenna if you buy a UV-82. 3. You review above mentions that harmonic suppression has suffered, and I was curious how much of a concern that is when it comes to radio performance, range, battery life, interference with other devices, etc… Is it something to be really concerned about, just an annoyance, or a technical “technicality” that is interesting, but not worth thinking about if you like everything else about this radio? As a side note, I suspect it’s a hardware related thing that couldn’t be fixed by firmware, right? Squelch: no idea, maybe someone else? Antenna: the stock antenna of the UV-82 is as good as it gets. No reason to ‘upgrade’. More sturdy than the $3.79 antenna, too. Harmonic suppression: performance won’t likely suffer, nor battery life, but there’s always a chance that a harmonic interferes with other services. For that very reason I’m always concerned; it could cost me dearly if my signal is spotted somewhere where it’s not supposed to be. Most filtering is still done the old fashioned way – coils, caps and trimmers. Do you think the harmonic suppression is something they might fix over time in the same model once they start selling it (e.g. maybe better now than when you bought yours? ), or do they typically not make further improvements other than firmware once they’ve released a given model of radio? You never know. I’ve seen updates for the UV-5R which made things worse (harmonic suppression, TX audio). Can anyone tell me what the scan speed is of the UV-82 vs the UV-B5? The UV-B5 is slightly faster, about 6 chan/sec instead of 4 chan/sec. Still notoriously slow when compared to a real scanner though. Hans, Thanks for the review I do have the 82L was my first Baofeng. The question I have is with the scan function ,when I select it I don’t hear anything. The operation frequency arrows move up and down but as soon as I turn it off I hear transmissions. Do I have something set wrong?? Are you scanning in memory mode or VFO mode? Is TDR (dual watch) switched off? I am scanning in Channel mode and TDR is on. Hans, just found your review. Excellent! I’ve been looking for a pair of HTs to use for a backcountry trip and in addition to the UV 5Rs and 5Bs I’ve come across the slightly upgraded GT-3 and clones like the Tonfa UV-985. I’ve also read about non-Baofeng clones like the Anytone AT-3318. 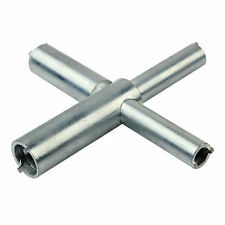 Before reading your information I had believed I needed something with solid Tx of 5w or more and aftermarket antennas. But really what I’m looking for are good Tx and Rx performance, cheap and accessible extra batteries and decent keypad or laptop programability. Have you had any experience with the Tonfas and Anytones. What HT do you recommend at a low price point and if price weren’t as much of an issue what would you recommend for a higher price point? Thanks for all you’ve done to help spread the word on low cost HTs. Tonfa has a rather poor reputation. The quality of Anytone HTs is unknown. If they’re as sloppy with HTs as they were with their first generation dual-band mobiles, you can expect to run into a few design flaws. The way I see it at this point in time (can change at any time, depending on new models! ): buy the UV-82. Decent keyboard, good stock antenna, and plenty of output power. No major problems to report, except the construction of the charger (can be fixed easily). Back country trips, you say? If money would be no issue, I would go for a Yaesu FT-270R. Lots of power, great audio, and 100% waterproof (IPX7). I have its predecessor, and it appears to be indestructible. I have heard of a few people having good luck with their chargers, but in case yours does act up here’s a video with the fix (thanks Hans for the blog on the fix): https://www.facebook.com/photo.php?v=260871970744773&set=vb.251150705050233&type=3&video_source=pages_video_set also see my other msg below with the FB page on the UV-82. Check it out, it also has a video in regards to if your charger is acting erratic and not holding a solid red light when charging, etc. Cool, I’ve liked it, will read through it, and double check my charger. 🙂 Thanks. 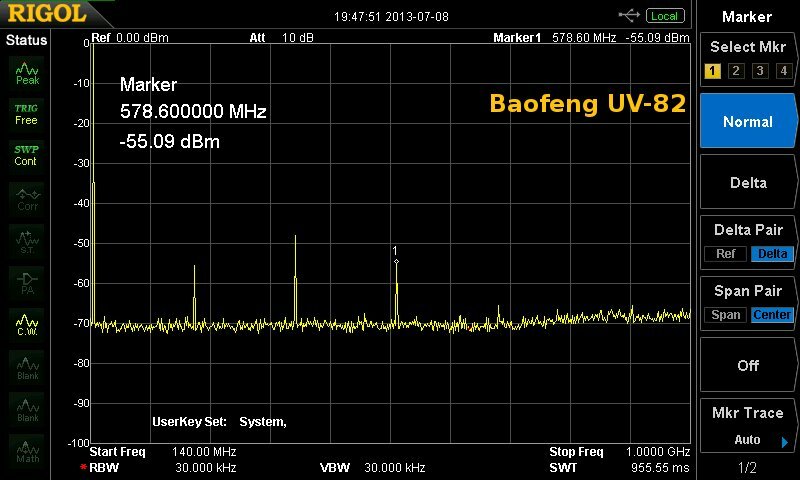 I use Baofeng UV-82 in Romania and i cannot use it to transmit ,only to receive.I use it for example on 173.338 frequency and i cannot transmit anything.I don’t know the offset here, i tried many offsets but nothing worked.Can you help me? I cant use this transceiver.Thanks! The frequency 173.338MHz cannot be entered directly. This will allow you to enter 173.3375 which May be close enough. There are an infinite number of possible offsets. You will need to speak with an authorized technician to determine the frequency for that particular license. Can it be that the people you are trying to talk to are using a different radio? Some radios (Motorola for example) have CTCSS aka PL tones programmed out of the box. They will only hear you if you transmit the same code. If anyone knows how to get the UV82 apart WITHOUT breaking the case, please let me know, i have removed the screws and tried to gently prise the cover off, but stopped short of the dreaded cracking sound i knew was coming if i persisted. If someone knows how to do it, and has acheived access to the mainboard components, please let me know. Remove battery and volume knob. Remove remove the nuts holding on the antenna connector and volume control. Pry the lower part of the frame from the plastic case with a thin blade screwdriver. The frame snaps into and out of the case. Caution: The speaker wires are fairly short. Remove the frame from the case by sliding the frame downward. Remove the many tiny screws holding the PC board to the frame. You may need to unsolder the antenna connection to the PC board. What I did to make reassembly easier for experimenting in the future, I used a Dremel to cut away part the part of the frame so the antenna connector doesn’t need to be unsoldered every time I take it apart. I just got the baofeng a52 for a few days and I have the pofung uv82 in delivery from china, and so far the baofeng is working okay but don’t know about the rx ? the baofend is very sensitive but I’m not sure how it handles intermod? I live in the country where there’s there’s no intermod issues . anyway I got these little cheap ham radios to bang around with and you can’t complaint for being a cheap radio. the selling point is the large speaker and big battery which they claim 2,800 amps! The UV82 is a work horse, but the battery, regardless of the label, is 1800mAh. Did You test the GT-3 compare to the UV-B5 in term of front-end /sensitivity/IMD etc. please? 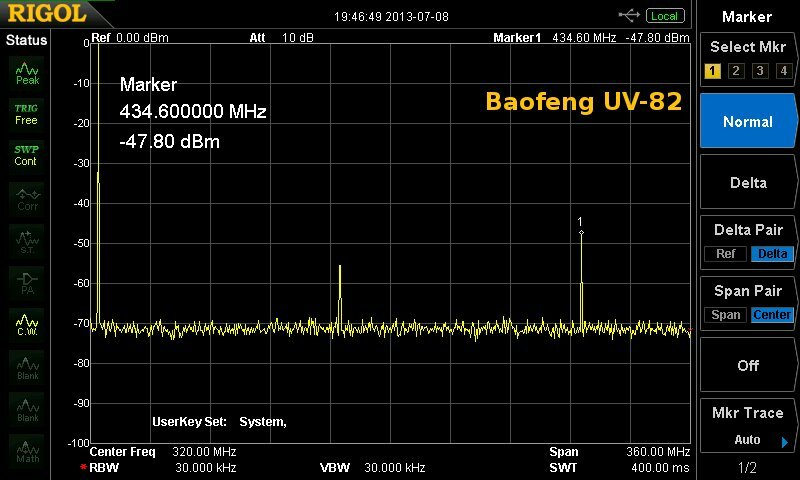 I’m working on the receive scanning function of the Baofeng UV-82. I would really like the radio scan to ignore #1 and #2 and stop only on #3. Is this just a firmware problem or do I need a new brain alignment? If you’re having trouble programming the UV-82 you can try my YouTube videos where I go over the process step-by-step using the Chirp Software. There’s actually 3 videos and they all provide links to each other. There’s also an extensive FAQ section. i found a firmware bug on firmware b82s25, you cant store frequency offset’s to the memory from the keypad! someone tel MIKLOR and Baofeng. you never could enter an offset from the keyboard into memory. Instead you enter the receive frequency into a memory, and then the transmit frequency into the same memory. The same is true for the Baofeng UV-5R. then i key in the receive frequency. then go into the menu and set the “SFT-D” transmit shift direction. and then the “offset” for the transmit frequency difference. and it all works as it should. press PTT and the frequency changes. go back into the menu and store it into a channel, and the offset is stored as 0000 even though it’s still correct in the menu. it’s not transfering the offset from work memory to channel memory. but if i vew the offset with the menu it says 0000 even though it’s not – because it still shifts on transmit. so it IS a bug. that radio as a “professional” gear . I just pulled a UV82 B82S25 off the shelf to run a test and it works fine. – You possibly didn’t delete the channel and tried to add the offset to an existing channel. You must delete a channel (menu 28) and start from scratch. Menu 25 will allow you to enter an offset if the above two conditions are met. and everything should work fine. Don’t skip any of the steps. o.k. i read the link. whati didnt do was reverse it with the scan and store it again. that sounds totally illogical, that’swhy. so it’s still got a software problem even if it’s just displaying the internal settings. Baofeng needs to start including a programming cable with these things. and given the trouble windows has with usb, it should be a traditional serial cable. My experience with CHIRP has been is that CHIRP displays Zeroes in the offset field is if the Duplex field is set to None. i dont use windows – 100% Linux since about 06!! thanks for explaining the strange programming method though. now i need to buy another one or two. or maybe the new uv-5x if they are *really* waterproof. the miklor programming instructions – not surprisingly, dont work. writing into the same memory location twice still wipes the offset to 0000, it just replaces the rx frequency with the tx one. so Baofeng needs to fix the firmware. and they need to use a damned flash chip in future too, people would pay another 5Euro for the ability to update the firmware whenever they screw something up. so i’m not getting any more uv-82’s till the firmware get’s updated, i’ll wait for a review of the uv-5x. i suspect because the offset works fine till you store it, that the bug is the offset being read and written to the wrong eeprom location by the menu routine. i’ll take a clean eeprom and store an offset value in it, then dump it with chirp and see if it’s actually in the dump with a hex editor. if it is, i’ll put the same offset in another fresh eeprom file with chirp and then compare them to see if the data is in different locations. while i’m at it, i’m going to see if i can mod chirp to silence the alarm mode. i think the radio can do it because it’s an option in the latest chinese pc software. the radio is not saving the offset frequency or the duplex setting into the eeprom. it’s only a few weeks old, they wont have anything different to replace it with. i have a 2year warranty, so i’ll wait a while for new firmware – then press them on it and they may give me a new replacement. Some high resolution images of the UV-82 PCB if it interests anyone ..
Stephen, if you do get them to update the UV-82 firmware, ask them to add the ability to swap between channel mode and frequency mode by pressing and holding down the Menu button for say 1 second. It would save having to switch off and on the radio. But yes, a flashable CPU would be nice. We could always replace the current CPU with the flash version of the same CPU (if you can find someone who sells them), looks like ELAN (the CPU manufacture) do the same CPU with flash option, so would be a simple case of swapping the CPU over. i doubt we will see them use a flashchip even if it is in their interests. also, i cant see them giving you a vfo switch, i think that was removed to get u.s. part90 compliance for comercial radio. if they were smart they would use flash and make the software opensource. then other people would fix bugs and add features to help sell radio’s without them lifting a finger. for example, i’d rip the alarm-mode out and use that button to switch vfo/channel mode. the most we can hope for is Baofeng engineers reading stuff liike this on the net. incidentally, go on ebay and search “uv-5x” it’s a very new radio – not another uv5r. if they can keep going in that direction and give us flash in the future then we may get a yeasu killer – solid, waterproof and opensource. The same website also claims that you can program 25 FM radio stations (you can’t) and that the range is a whopping 60 Kilometers. i’m getting a repeater at about 60k in 70cm band. it’s doable, but not between 2 HT’s, the repeater has a mast on a hill. I opened the batterycase. The Baofeng-sticker on the battery says: 2.800 mAh. 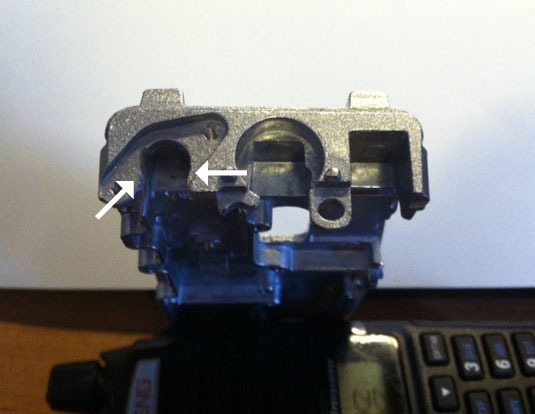 In the batterycase is a Baofeng-sticker, that says: UV-82 and 8W. So it seems, that the specifications have changed, but the manual did not. The battery is labeled 2800 mAh, but in fact just 1800 mAh. When I found out and confronted Baofeng with this they confirmed my findings, apologized, and said that the batteries were ‘accidentally mislabeled’. Unfortunately these batteries are still floating around and sold. About 8 Watts: the only thing that counts is measuring output with calibrated test equipment. Specs are often one big bunch of lies and exaggerations. Hans… three months ago I bought a UV82 with B82S25 version, it works like it suppose to be. Then the speaker and its strobe/flash light does not function after using it with the stock ear piece with ptt mic for a month or so. Now I’m just using the radio with the earpiece plugged in. Can this be fix? This is one of the most common defects. When you plug in a programming cable or earpiece, the 3.5mm and 2.5mm plugs push aside some contacts in the radio. These contacts are supposed to spring back into place after you remove the connector. However, the quality of these spring contacts is rather poor, and sometimes they do not what they’re supposed to do. The result is that either the internal speaker, or the internal microphone won’t work anymore. Unless you can solve it by plugging in and out a few times, there’s a chance that you have to open up the radio to fix it. In certain instances you need to replace the chassis connectors. A hell of a job. I was lucky once with a Puxing. I sprayed a very (very!) small amount of WD40 into the connectors, after which the problem disappeared. No idea about the flash light; I never heard that these problems could be related. Unfortunately I don’t have the test equipment, so it stays uncertain for me. Leo, Item 8.1 at http://www.miklor.com/uv5r/FAQ address the audio issue. The strobe situation is new to me. hi, I would like to program a UV-82 down to 127MHz and I did it through the Chirp software. I set it to 110MHz to 155MHz and it uploaded fine. I plan on tuning on a control tower frequency to strictly listen to comms between pilots and tower. The upload was successful and I can tune it from 110 to 155MHz but I do not know if the electronics inside can actually tune to these frequencies as I haven’t had the chance to “listen”. I live in a very small and remote area with a small airport so there are not that many flights coming into and leaving out of here. Can someone chime in on this? On a side note, when using the programming cable I noticed that the HT would cycle from standby and transmit (indicated by the backlights) and I just didn’t mind it. After about two to three minutes I noticed the display becoming dim so I picked up the radio and switched it off. It was very hot. I disconnected the cable and removed the battery and felt that the metal chassis was extremely hot. So I set it aside to cool down and then inserted the cable again and went into the software. The cycling was still there so I disconnected again. I read back on the Miklor site and found that the USB driver needs to be the 3.2 version so I checked the version on my laptop and it was newer than 3.2. I followed the instructions to install the 3.2 version and after that the cycling of the radio was gone. So to anyone planning on using the programming software, make sure to use the 3.2 version of the USB driver. Thanks for the tip about the USB driver. Regarding receiving air traffic: even if your radio will work on those frequencies (I found out that workable boundaries vary from sample to sample), please remember that air traffic uses AM (Amplitude Modulation), not FM (Frequency Modulation). AM is not supported by Baofeng radios. You might hear something occasionally, but it will sound distorted at best. Oh I see, since air traffic is AM, I won’t bother with it anymore as this Is a FM transceiver..Thans Han. I will check out the link that you gave me John, thank you. As for the Frequency Range, CHIRP allows you to key in the any frequency. The limitations are what can the radio filters tolerate. 127MHz is pretty much on the very edge. I will check out this link John, thank you. I have checked out the link and found it very informative. So basically I can program any frequency I wish and tune to that frequency and it shows on the display…but if that frequency is beyond the design parameters of the radio, then the actual electronics inside are not really tuned to that frequency. Am I correct in this? It would have something to do with the crystal for the L.O. which limits the upper and lower frequencies, right? In the link I have also read that the expanded coverage is from 127.8 to 176 MHz for Tx, and for Rx it drops sharply to zero when outside the factory design specs. Does this mean that the radio can no longer receive at 135 MHz and lower, and also not be able to receive at 175 MHz and higher (within the VHF band)? Sorry if this is a dumb question but I just need to be very clear about this. The UV5R and UV82 are pretty much the same receiver. Definitely not a dumb question at all. Although the specified VHF range is 136-174 MHz, the radio can actually operate at 127.8-176.0 MHz with no modifications. Anything beyond those limits will be choked by the filtering. This is to prevent stray interference from the transmitter and well as preventing interference from outside the specified limits. I see. So this means that a radio’s front end is like a band-pass filter. Is it theoretically possible for a front end to be “open” so that it receives any frequency and if so, why haven’t manufacturers gone this route in designing their radios? Government restrictions perhaps? Try the uv-82 videos on the YouTube “the erod1944 channel”.